The battleship Arizona burns furiously after being hit by a Japanese bomb that detonated in its forward ammunition magazine. More than 1,000 sailors were killed on the Arizona. The battleship Tennessee is directly in front of it with the partially sunk West Virginia next to the Tennessee. 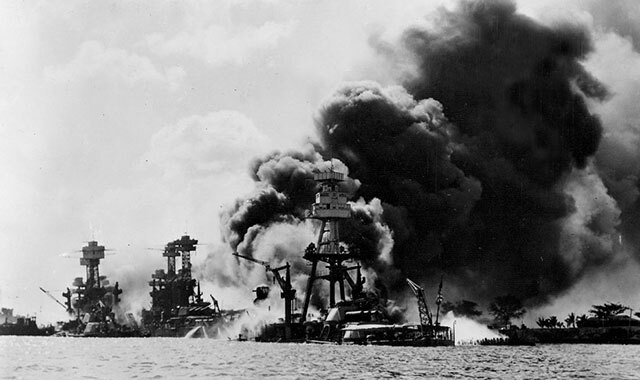 On Dec. 7, 1941, our nation’s destiny was forever changed when the Japanese attacked the U.S. Naval base at Pearl Harbor, Hawaii, thrusting our country into World War II. Nationwide, fewer than 2,500 of the about 60,000 Pearl Harbor veterans remain. Several local veterans witnessed the devastating air raid and have, through the years, shared their experiences and some lessons learned from Pearl Harbor. These lessons are just as relevant today as they were 75 years ago. “Always alert” is the message the late Bill Foster, a Rockford resident, conveyed over and over again, as he made it his mission to educate young students at local schools about the sneak attack on Pearl Harbor. After leaving the Navy, Foster spent much of the rest of his life educating the public about the importance of military vigilance to make sure a similar attack would never again catch the U.S. off guard. At age 21, Foster was a sailor stationed aboard the destroyer USS Selfridge, which was moored at Pearl Harbor when the air raid took place. Foster was the engineer on board a small motor launch (boat) that was picking up supplies for his ship, when the Japanese planes started to attack shortly before 7 a.m. He was right in the middle of Pearl Harbor as the bombs began to fall. Some of the Japanese planes were so low they seemed to skim just above the water. “You could see the pilot smiling and even see his gold teeth! It was something you never dreamed of,” he said. Foster made it back to his ship, which was docked alongside several other destroyers, and immediately began waking up crew members, who were sleeping late that Sunday morning. Soon crew members headed for their battle stations. Since the ship was low on fuel, Foster and others hooked up fuel lines so they could get underway. By 11:30 a.m., the Selfridge headed out to sea, passing wreckage strewn throughout the harbor. “The ships were still afire, still ablaze. The bay was filled with oil; there were men swimming in it. There were boats trying to pick them up,” recalled Foster. Despite the carnage – more than 2,000 American lives were lost that day – Foster didn’t feel afraid during the attack. He felt lucky to have survived the attack but wondered how our military could be caught so off guard at one of its largest military installations. Foster died in 2009 at age 88. The late Vern Lundstrom, a Navy veteran born and raised in Rockford, was aboard the battleship USS Nevada on Dec. 7, 1941. “We were just finishing up breakfast when somebody came running in and said, ‘go to your battle stations, we’re being attacked!’” he recalls. Lundstrom was a 23-year-old sailor assigned to mess cook duty. The Nevada was one of eight battleships in Pearl Harbor on Dec. 7 and therefore a central target. Lundstrom was in the Chief Petty Officer’s quarters, just below the main deck, when the attack started. The Nevada was the only battleship to get underway that Sunday morning and almost made it out of the harbor. But after being struck by at least five Japanese bombs and one torpedo, it was beached near the entrance to the harbor, intentionally. This way, if the USS Nevada sank, it wouldn’t block the slim channel heading out to the open sea and prevent other ships from escaping. Fifty men on board the USS Nevada lost their lives during the attack, including a close friend of Lundstrom’s who died of severe burns. After the war ended, Lundstrom returned to Rockford and worked for 30 years in maintenance at the Rockford Public Library. He joined the Pearl Harbor Survivors Association and returned to Pearl Harbor for both the 50th and 60th anniversaries of the attack, to touch base with his shipmates and to honor fallen sailors. Lundstrom died in 2009 at age 90. At age 92, Jack Evans is among the few remaining survivors of the attack. The retired Navy Captain was a 17-year-old seaman, assigned to the battleship USS Tennessee, on Dec. 7, 1941. Seaman First Class Evans got up at 6 a.m. that Sunday, ate breakfast and finished his cleaning duties. He was trying to decide whether he should attend church services when the general quarters alarm sounded about 7:55 a.m.
That anger soon turned to surprise as he made his way toward his battle station. “I got up one deck higher and heard a ‘fra-ump’ [loud noise] and thought, ‘what is this, something is going on.’ So I picked up my speed and got to the main deck. As soon as I got to the main deck I could see that bombs had been dropped, planes were upside down, something really bad had been happening. So I went up that ladder really fast to get to the top of the foretop [his battle station]. Evans’ ship, the Tennessee, was moored in “battleship row,” a line of battleships docked closely together along Ford Island that made them easy targets for the Japanese aircraft. Directly behind the Tennessee was the battleship USS Arizona, which exploded in a ball of flame when a Japanese bomb detonated in one of its ammunition magazines, ripping the ship apart and killing more than 1,000 of its crew. “I wasn’t looking at the ship at the time of the explosion, but I felt it,” remembers Evans. “It felt like the foretop was going to snap off – it was that violent. And of course, as soon as I could, I turned and looked, and the heavy smoke and fire was coming up to a great height. And that’s when I saw the great chunks of metal flying from the ship. So I knew the Arizona had blown up. While the Tennessee was protected from Japanese torpedoes by being docked inside of the battleship USS West Virginia, it couldn’t escape being damaged by Japanese bombs. That same bomb burst also sent a piece of shrapnel up into the foretop of the mast of the Tennessee, wounding Jack Evans in the legs. Evans wasn’t the only sailor wounded on the Tennessee. The second bomb that struck the battleship hit turret No. 3. Despite the overwhelming death and destruction of the attack, Evans says he wasn’t scared and neither were most of his crewmates. Even so, Evans clearly remembers just how exasperating it was not to be able give the Japanese attackers some of their own medicine. Evans’ ship, the Tennessee, was one of the least damaged vessels at Pearl Harbor. It was able to sail out of Pearl Harbor on Dec. 20, Evans’ 18th birthday. It headed back to the mainland for repairs and upgrades and went on to play a major role in several naval battles during the rest of the war. Evans remained onboard the Tennessee until 1943, when he left with a set of orders for Naval flight training school, his dream job. In time he was promoted to Ensign and, by the end of World War II, he was a pilot, flying twin engine anti-submarine aircraft known as PBYs and PBMs. But this was just the beginning of Evans’ naval career. He would serve his country for 34 years in the U.S. Navy and rise to the rank of Captain. Before retiring, he would not only serve at the Pentagon, but also command his own ship, the USS Pyro, during the Vietnam conflict. That ship helped supply aircraft carriers and surface warships with ammunition. Today, Evans lives a quiet life with wife Nancy in southern California. He still enjoys taking part in occasional events that honor veterans and their service. As he looks back at the attack on Pearl Harbor, many thoughts come to mind. He also advocates military readiness. “When you’re a world power, if you’re not ready for the contingences that you might expect in the world you are living in … We shouldn’t be reluctant to take steps to keep our military strong,” he says. Evans plans to attend local events in southern California on Dec. 7, to honor fellow veterans and spread his message about military readiness. Bob Ryder is a former Marine sergeant who served in Operation Desert Storm in Kuwait and Saudi Arabia, and was awarded the Joint Service Achievement Medal for his service as a Marine Corps Combat Correspondent and broadcast journalist with the Armed Forces Desert Network. He’s a lifetime member of the Marine Corps Combat Correspondents Association and has received numerous awards for his work from the organization, including Best Television News Story and Best Radio News Story. Ryder’s father served as a sergeant in the U.S. Army with the First Cavalry Division during World War II, fighting in the jungles of New Guinea and the Philippines. Ryder worked as a senior reporter and substitute news anchor for WTVO, the ABC affiliate in Rockford, for almost 20 years, and was recently named Superintendent of the Veterans Assistance Commission of Boone County, a local agency dedicated to helping veterans and their families in need. He has had numerous articles concerning military and naval history published. This entry was posted on Wednesday, November 16th, 2016 at 11:57 am	and is filed under Features, Top Posts. You can follow any responses to this entry through the RSS 2.0 feed. Both comments and pings are currently closed.